So we got an advent calendar at the house now. And I thought I wanted to do that here. But I thought pictures of me would have been too vain. So I'm going to feature pictures of Nunu. But to make it more of a challenge for me. It's only going to feature stuff Nunu likes to chew. There's got to be 25 at least. The cat ball: A simple little cat ball is still one of her favorite toys to play with. But what if you would record a daily video from nunu playing with his toys, that would be really cool. I love the idea of a Nunu Advent Calendar although I am a bit concerned that she has 25 different things to chew on. Her poor tiny little jaws must be so sore. So cute I can't stand it! I have kittnes myself! that;s too cute - I could still never own such a tiny dog, but it's cute to look at. Nunu is one tiny little doggy. Was she a puppy in that picture? Great idea for the doggy advent calender. Thanks for the Advent Calendar. I went into Walmart and asked for an Advent Wreath and they just looked at me like I was from Mars or something. Maybe because I've moved into the Bible Belt where Baptists don'r really celebrate Advent like the rest of us protestants and catholics do. So, why do you think so many tallented showbiz types (like you) hail from such an unassuming state? Enjoy paradise while we slip into the icy winter here on the 48. This is going to be a great month - new cute pix of Nunu every day! Thanks and best of December to you! Awww, she is soooo cute. I just want to hold her and give her a big kiss. I love seeing your pictures of Nunu! I wish I had one! 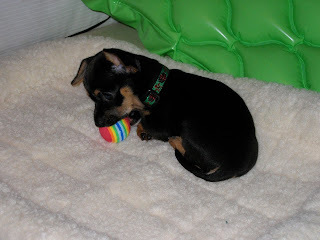 Adorable...besides seeing 25 days of chewy things, it will be interesting to see how much Nunu grows in just 25 days. hehehe can't wait for more!!!! oh my gosh NUNU is so cuuute!!! OMG What a cutie I love that 2nd picture! Most awesome advent calendar ever! Even is Nunu came from a pet store she was a rescue. Who knows what type of hellish home she might have ended up in? Is Nunu a chihuahua? I really can't tell as I don't know dog breeds that way. She is so small and cute, I could snuggle all day with her. One of my cats has three of those same balls. He will only play fetch with them. He has other colors and patterns but they are just left behind, lonely. Is this Nunu as a puppy? I just got a new chi puppy, Bowie, and she and Nunu could be twins based on this pic! Thanks so much for the advent calendar! 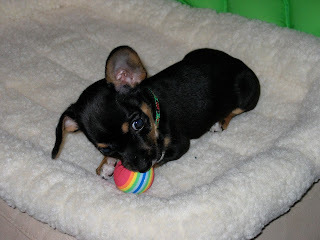 Oh and Bowie has tons of toys, but her favorite things to chew on are my fingers and my 5 year old chi, Delia. It's just the perfect size for her! My kitties have this ball...it has nice little bite marks ALL over - almost as popular as their very realistic mousies - which they drown regularly in their water bowl. Nature is cruel sometimes.